Sign at Long Island park closed by mosquitoes. Dead mosquitoes cover several tables in a Yaphank office; but there is no bug problem here. In fact, the Health Department researchers poring over the insects are working to prevent an outbreak of West Nile virus. "The mosquito numbers, compared to last year, are up fifty-five percent," said Dr. Scott Campbell, who leads the mosquito trapping for the Suffolk County Health Department. There are more mosquitoes and more bugs testing positive for West Nile virus, explained Campbell. In all, sixty eight mosquito samples in both Suffolk and Nassau counties have already tested positive for the potentially deadly virus. "The concern is that this will translate into more human exposure," said Suffolk County Health Commissioner, Dr. James Tomarken. That fear is a big reason, health officials said, why pesticide spraying for mosquitoes has been ordered for three nights this week in several Long Island communities. "We don't take this lightly," said Nassau County Health Commissioner, Dr. Maria Torroella Carney. "We don't spray regularly but we are doing this now to prevent human disease." So far this year there has been one confirmed human case of West Nile virus. The unidentified 66 year old New Hyde Park woman was diagnosed earlier this month and is now recovering. A Huntington man has also been hospitalized with a suspected case of West Nile. West Nile symptoms include fever and bodily aches and pains. This year has the potential to produce many more human cases, officials said. The number could exceed that of even 2008, when four people died from West Nile. The threat wasn't lost on patrons visiting Hauppauge's Blydenburgh Park. 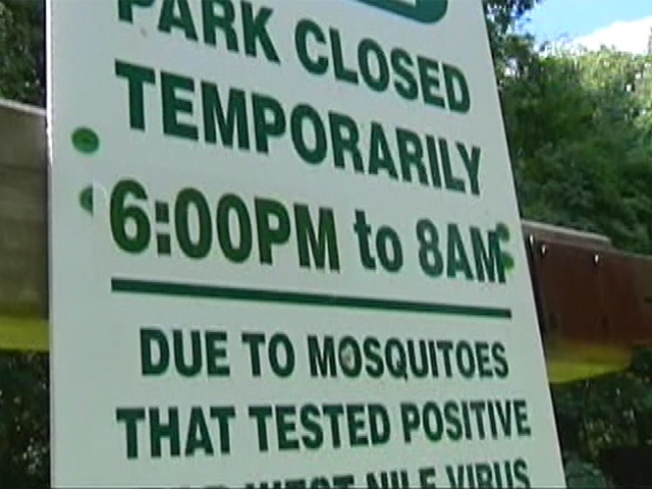 West Nile has already been discovered there, prompting county officials to order the park closed after dark. "It is definitely a concern," said Melanie Apostolico of Holbrook. "I just sprayed myself before coming here because I do get bitten." The pesticide Scourge will be sprayed from trucks to kill adult mosquitoes. Although the safety of the pesticide is still being studied, health officials insisted the threat from West Nile outweighed that from the pesticide. The communities of Greenlawn, Selden, Massapequa, Massapequa Park and North Massapequa will be sprayed Tuesday night. Residents are urged to remain indoors and to bring children's' toys and dog bowls indoors as well..
All homeowners are also urged to remove standing water from their propertie -- that is where mosquitoes breed, officials explained. No one can say why the West Nile threat is worse this year; but, according to health officials, the combination of a wet spring and dry summer may be to blame.